Last month I began an experiment looking at the effectiveness of drying kveik (Norwegian farmhouse yeasts). The short version is that I dried the yeast slurry from an IPA fermented with the Voss kveik strain. I didn’t use anything fancy for this – in fact, I used a cheap food dehydrator that uses a fan and an unregulated heater to dry the food. Despite the cheap dehydrator, the dried kveik had over 99% viability 24 hours following drying. Today, 1 month after drying, I’m repeating the viability assay to see how the yeast has held up. To be clear, the dried kveik has been placed in a plastic zipper bag with most of the air pushed out. This bag has been stored in a freezer at -20C (-4F). But nothing else has been done to aid the yeasts’ survival. As with last time, I assessed viability with trypan blue. This is a dye which is excluded from living cells, but which stains the interior of dead cells a deep blue. To start, a small amount of dried kveik is rehydrated in 1 ml of sterile water. I allow the kveik to dehydrate for 15 minutes, then stain with trypan blue. 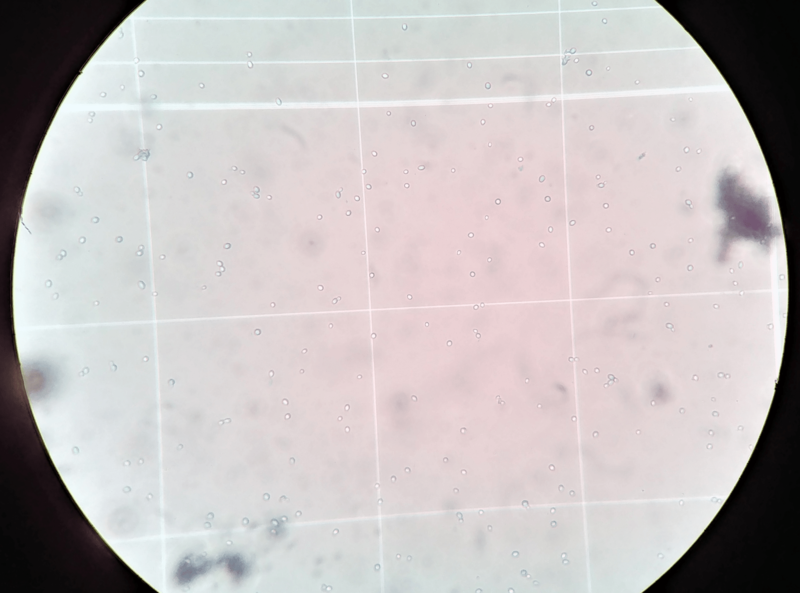 The sample is then immediately loaded into a hemocytometer and imaged on my microscope. While not obvious in the image to the left (click image for full size), there are some cells that stain a faint blue throughout. After counting 8 fields, I found that the yeast had 94% viability. This is down ~6% in a month. If that rate holds true, kveik stored in this manner should be usable (>50% viability) for ~8 months. Viable yeast should be recoverable for several years. Join me again this time next month, when we check the kveik’s 2-month viability! Is there any concern for the unfiltered air being pushed through the dehydrator? Do you think this method could be used by the home brewer for any yeast strain? There is a risk of infection, but it should be low. As common as beer spoilage organisms are, they don’t have wings, so unless you live in a very dusty home or frequently aresolize bacteria-containing materials, it should be fine. After all, Norwegian brewers have kept these yeasts going for decades (if not centuries) using far less sanitary techniques without issue. As for other yeast strains, it is unlikely this method will work. Kveiks are unusual in their tolerance to dehydration. Conventional brewers yeasts are normally killed by dehydration, unless you add cryoprotectants before drying. Looking forward to the assay in a month! Shall we take bets on whether the viability drops linearly over time (e.g., 6% per month)?